The Rainforest Cafe is a kid friendly restaurant that is sure to please even the youngest members of your family. Throughout the year the Rainforest Cafe offers a great line up of events that encourage tots to teens to participate, including interactive live animal encounters where children can learn about rainforest animals. Additionally the Rainforest Cafe offers face painting during March Break and Easter so that kids can become their favorite animal! (Please check for availability). 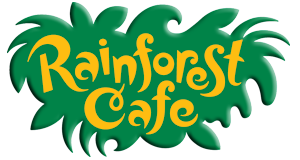 Ideally located on the Falls Avenue Resort the Rainforest Cafe has easy indoor access to a variety of other kid friendly activities including the 3 acre Fallsview Indoor Waterpark, and directly beside the Rainforest Cafe is Adventure City. The Red Foot Tortoise, White Lipped Python, and a variety of other animals are on display at various times throughout the year for your child to experience! The Rainforest Safari experts provide interactive animal encounters providing fun facts about the various animals. When these animals are not part of an educational encounter put on by one of the rainforest safari experts they are kept on display in the entrance of the Rainforest Cafe located at the Clifton Hill entrance. In addition to the animals on display and the animal encounters, the Rainforest Cafe Niagara Falls also has a shark tank and tropical fish tank. As soon as you enter the restaurant you are welcomed by a 5500 gallon aquarium that is home to the White Tip Reef Shark along with horse eyed jacks, blue damsels and more. Once you are inside the Niagara Falls restaurant you will pass by a 750 gallon Tropical Fish Tank that has various reef fish including Puffers, Tangs, Angel, Lion, Triggers, Wrasse Fish and more. The largest rainforest in the world is the Amazon rainforest. Rainforests act as the world’s thermostat by regulating temperatures and weather patterns.